We couldn’t close out the year without a batch of buttery shortbread. This recipe, from Spice Islands, adds creamy caramel, a dark chocolate ganache icing and a sprinkle of sea salt. The recipe includes cashews. You can substitute another favorite nut (macadamias, pecans, pistachios, walnuts) or omit the nuts entirely. National Chocolate Caramel Day is March 18th. For another yummy recipe, check out this Chocolate Caramel Turtle Brownie Recipe. 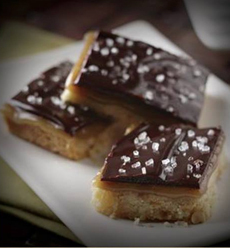 Shortbread topped with caramel, chocolate and sea salt. Photo courtesy Spice Islands. 1. PREHEAT oven to 325°F. Line a 9 x 9-inch baking dish with aluminum foil leaving overhang on 2 sides. Lightly grease the foil on the sides of the pan. 2. MAKE shortbread crust: Mix butter and sugar until well blended in a bowl. Stir in flour and cashews until a stiff dough forms. Press dough evenly onto bottom of foil lined pan. Prick the dough using the tines of a fork. Bake shortbread 20 to 23 minutes or until light golden brown. Remove from oven and place on wire rack. 3. MAKE caramel: Stir brown sugar, cream, butter and corn syrup in a heavy saucepan. Cook over medium-high heat until mixture begins to bubble. Stir in salt and mix well. Continue to cook at a full boil without stirring for about 8 to 10 minutes until candy reaches 240°F. Stir in vanilla. Pour caramel over shortbread crust. Cool completely, about 2 hours. 4. HEAT cream and chocolate in microwave on HIGH (100% power), stirring every 15 seconds until chocolate is melted, about 30 to 45 seconds. Evenly spread Ganache over caramel layer. Top with coarse sea salt. Place in refrigerator 10 minutes or just until chocolate is set. Cut into bars. Find more of our favorite cookie recipes.